Since 1998, I have made three long documentaries and three short ones. 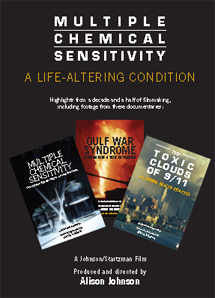 During this fifteen-year period, I have gained a much deeper understanding of multiple chemical sensitivity and its great impact upon so many lives. This new composite film contains the best and most effective sections of my six earlier films. I have chosen carefully which experts and patients to use from my earlier films so that this new film will be an effective way of helping people to understand multiple chemical sensitivity. The film contains footage of interviews with four members of Congress as well as with many important physicians. “I was privileged to work with Alison Johnson as she did research on the role of chemical exposure to the unexplained illnesses of Gulf War veterans. Her works on exposure to toxins and chemical sensitivity with their attendant health effects are landmarks in a poorly understood field. Alison Johnson is clearly a gifted researcher, writer, and film maker." –Ronald R. Blanck, DO, Lt. General, U.S. Army, Ret. “There is no question in my mind that multiple chemical sensitivity is a very serious and growing problem affecting many, many Americans. Your video does an excellent job in explaining current thinking about the causes of the problem." L. Christine Oliver, M.D., M.P.H., M.S. Lt. Gen. Ronald R. Blank, D.O. William J. Meggs, M.D., Ph.D.
Gerald H. Ross, M.D., practiced environmental medicine in Dallas, Texas, for twelve years. He was the first director of a clinic in Halifax, Nova Scotia, that is the first government-sponsored clinic in the world established to evaluate and treat patients with chemical sensitivity. Gunnar Heuser, M.D., Ph.D., is a toxicologist in private practice and is also Assistant Clinical Professor of Medicine at UCLA School of Medicine. or $6 for priority shipping & handling.